The yacht was available with a choice of two rigs (masthead or fractional) and three levels of internal fittings ranging from stripped-out racer to fully fitted cruiser. The cruising versions were the most popular Although the accommodation is reasonably spacious in floor area, there is a maximum of 1.37m ( 4’6″ ) of headroom due to the flush deck. There is good sitting headroom all around the central area of the saloon but substantially less in the forepeak. Layout indicates 5 persons could sleep aboard but 3 is more realistic. Originally the boat had an inboard petrol engine but many have now been re-engined. 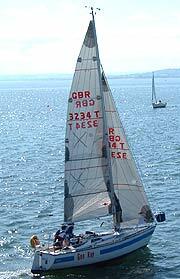 Around 320 boats were produced before production ceased in 1981. Westerly’s high production standards ensure that there are still many excellent example around today.